The TRS 5100 benefits from Marco's latest generation of electronic refraction technology. Replacing the standard refractor, it allows practitioners to control the entire refraction process from a keypad small enough to sit in your lap. This keypad also controls the CP-690 Automatic Chart Projector. And because the TRS 5100 is completely programmable, all the lenses are moved for you at the touch of a button, taking you to each new refraction step. While convenient for you, it is also helpful if you delegate refractions and want your technicians to perform the refraction steps in a specific order. The New Boston Vision Center, a state of the art Eye Care facility has purchased the newly redesigned M3. The M3 instrument is a three in one devise. The newly redesigned M3 presents several enhanced features such as a smaller footprint, to save even more space, and a new exterior design, but most importantly, the M3 now uses SLD (Super Luminescent Diode) and a highly sensitive CCD device to provide Zonal Ring-Image Technology. This makes it possible to now accurately measure patients with cataracts, corneal opacities, IOLs, and post LASIK. The New Boston Vision Center focuses on using top technology to allow our patients the most comfort and accuracy for their eye care. Patients enjoy time saving as the one machine handles many key functions at one time. The M3 unique compact technology is assisting the doctors at The Vision Center to streamline tests with accurate machines. The Marco M3 non-contact tonometer, auto-refractor, and auto-keratometer combines the measurement of refractive power, corneal curvature and intraocular pressure (IOP) providing fast, highly accurate, reliable measurements with significantly reduced measurement time. Its space saving design eliminates the need for multiple instruments, offering greater efficiency, and it interfaces easily with the patient’s EMR. Our optometrist in New Boston, OH use cutting-edge digital imaging technology to assess your eyes. Many eye diseases, if detected at an early stage, can be treated successfully without total loss of vision. Your retinal Images will be stored electronically. This gives the eye doctor a permanent record of the condition and state of your retina. 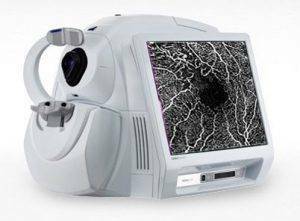 This is very important in assisting our eye doctor in New Boston to detect and measure any changes to your retina each time you get your eyes examined, as many eye conditions, such as glaucoma, diabetic retinopathy and macular degeneration are diagnosed by detecting changes over time.